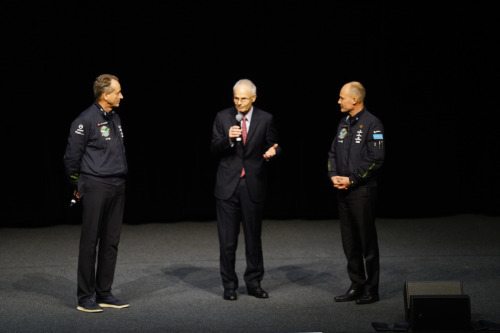 Nearly five months after the final landing of our favourite revolutionary airplane in Abu Dhabi, we – that is to say the Solar Impulse team – celebrated the end of this extraordinary adventure of flying around the world with no fuel with friends, partners, supporters and the public at the exact same place where the project took root almost 14 years ago. The Swiss Federal Institute of Technology in Lausanne – on the shores of Lake Geneva in French-speaking Switzerland – also known as EPFL, is a symbolic place to mark the end point of our project as it is where it was officially launched in 2003, following Bertrand’s vision of an airplane of perpetual endurance in 1999 and the feasibility study led by André in 2002. 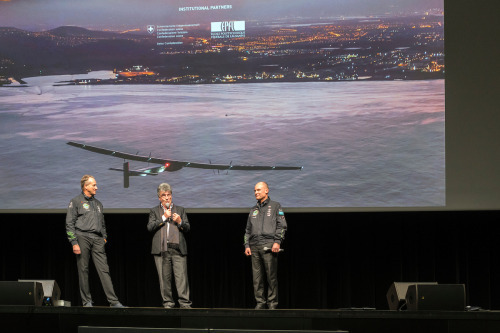 During the evening event, the World Air Sports Federation (FAI) also handed out certificates, not only to Bertrand and André for their record breaking achievements, but to the entire Solar Impulse team to pay tribute to their involvement in the pioneering round-the-world journey. In honor of his/her contribution, every member received a record for accomplishing the first ever round-the-world solar flight. A nice surprise acknowledging the immense dedication and perseverance of the team! In addition Bertrand received a record of both distance and altitude for the “electric engine” category for his historic transatlantic crossing from New York to Seville. Indeed, one should not forget that Si2 is a solar powered airplane, but with electric engines! Added to the already listed records, such as the ones that André received last year for duration and distance over the Pacific in the “solar airplane” category, and together with the team achievements, this bring the total number of FAI records to 23 for the entire round-the-world journey! But while 2016 is coming to an end and the final curtain is falling on the round-the-world adventure, there are still many exciting projects in the pipeline for 2017, such as solidifying the bases of the first of its kind World Alliance for Clean Technologies that was launched in Marrakesh during COP22 and continuing to work on new disruptive and innovative projects, such as unmanned and high endurance electric aircrafts. This blog post has been originally published here.